No one would deny that lying is a bad habit. Yet many people are clueless as to how big of a problem it is. Sadly, lying can become an unconscious and destructive habit. Let’s talk about the different kinds of lies and see if you recognize them. 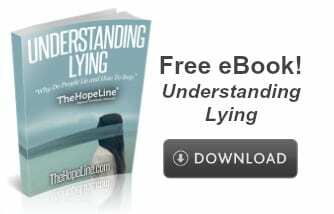 Understanding the different types of lies can go a long way in recognizing the issues that the liar is going through- whether it be you or a friend. A white lie is often called the least serious of all lies. People tell white lies claiming to be tactful or polite. For example, it could be making up an excuse for not going to a party, or showing appreciation for an undesirable gift. But telling white lies after awhile can cause conflict with others because over time they understand the insincerity. That is why white liars can lose their credibility. Patterns of white lies made over time can create distance between you and others, and destroy your credibility. Brandon admitted: Sometimes I say I have plans to do something when I don’t, just to get out of having to tell someone I don’t want to go with them. It seems like the better option, than saying I don’t like you.’ There are other ways Brandon could turn down somebody’s offer than telling a white lie. Sheriah said: I only lie when I tell people I am doing good when I am sad or depressed. I tell them that because I don’t want people knowing about what I go through and how my personal life is. By telling this white lie she is showing disrespect for the person who asked a relationship building question, and is putting up a roadblock to a deeper relationship. Broken promises are a failure to keep one’s spoken commitment or promise. Broken promises can be especially damaging when the person who made the promise had no intentions whatsoever of keeping their word to begin with.A fellow blogger wrote:I told a girl I know that I’d go with her to the game even though I knew I wouldn’t be able to go. I wasn’t trying to hurt her, but I didn’t know what else to do. What my friend doesn’t understand is that lying to the girl and breaking the promise does double damage, causing hurt feelings that could have been avoided. By breaking his promise he did great damage to her hope. She no doubt was all excited about going to the game with him, only to have her hopes dashed. Broken promises can lead to broken lives. Fabrication is telling others something you don’t know for sure is true. Fabrications are extremely hurtful because they lead to rumors that can damage someone else’s reputation. Spreading rumors is not only a lie but is also stealing another’s reputation.Paul wrote:I admit that I love spreading rumors. It’s all about telling lies about someone you don’t like. It usually works. A bold-faced lie is telling something that everyone knows is a lie. It’s simple and sometimes cute for a little child to tell a bold-faced lie about not eating any cookies, even though there’s chocolate all over his or her face. As we get older, we try to be more clever with our cover-ups. Some people never grow up and deal with their bold-faced lying even though others know what they’re saying is completely false. When people hear a bold-faced lie they are resentful that the liar would be so belittling of their time and intelligence. Spreading rumors is not only a lie but is also stealing another’s reputation. Sara said: I hate lying. Especially when I know everybody knows I’m lying. I feel so dumb. Sara isn’t the only one who feels dumb. The people she lies to could also feel the same way. Exaggeration is enhancing a truth by adding lies to it. The person who exaggerates usually mixes truths and untruths to make themselves look impressive to others. An exaggerator can weave truth and lies together causing confusion even to the liar. After awhile the exaggerator begins to believe his or her exaggeration. Amber confessed she thinks exaggeration actually helped her:I’m not good at really anything, so I lie about stupid things so that I sound like there is more to me. An exaggerator is a tragic person because he or she feels so little about themselves that they have to make up stories to look good to others. A deceiver tries to create an impression that causes others to be misled, by not telling all the facts, or creating a false impression.Jon admitted he was a deceiver:Sometimes I don’t like being seen as smart, so I’ll joke around about how smart I am just to try and get people to think that I’m not that smart. It works sometimes. It doesn’t feel like lying, I guess I’m just pretending to be something I’m not.Causing deception is a powerful and hurtful tool. It can be very subtle yet deadly. When people hear a bold-faced lie they are resentful that the liar would be so belittling of their time and intelligence. Plagiarism is both stealing and lying. It consists of copying someone else’s work and calling it your own. Plagiarism is a very serious act. Some college and graduate students have even been kicked out of school because of it. Scott asked a question and admitted his plagiarizing: Is it lying to copy something from the internet and call it your own? I do this sometimes when working on a paper for school and I run out of time. Scott seems to be confused about his plagiarizing. Yes Scott, it is lying. Just because it is easy to do does not make it right. Compulsive lying is often caused by low self-esteem and a need for attention; in fact, the compulsive liar finds it all but impossible to stop. A compulsive liar tells their mistruths even when telling the truth would be easier and better. Bree said:This guy I grew up with tells lies like its no tomorrow. What I don’t get is that I actually think he believes every word of the lie is true. I think it’s ridiculous. It is more than ridiculous, it is a tragedy. Have you ever told any one of these lies? Do you ever wonder if a person can get away with lying? Not really. You may be able to lie for a while, but in the end it will come back to haunt you. What starts as simple white lie over time can turn into a life-destroying habit. It’s important to know there is freedom in living and telling the truth. It may be difficult at first, but as Jesus said, The truth shall set you free. For more information and help, click the link below to download TheHopeLine® eBook. I lie to make other people fear/think bad of me. I exaggerate the truth and fake illness. I victimis myself and gossip about my freinds even though I was truly a victim of racism and child abuse. I can’t stop lying, I have bad grades in great classes, and freinds with true mental illness who I am drawn to and put me down. I have severe depression and I am homosexual. I am religious and I have broken 7 of 10 commandments. This is a little off topic, but what do you call it when A tells B the truth yet somehow makes B believe that A was lying to B? You can lie to your mom. You can lie to a cop. You can even lie to a judge or your doctor. But don’t lie to your partner. Otherwise, you’re just shackin’ up with someone you don’t really love or respect. it’s bold faced… bold, brazen, arrogant, self-important…. someone who thinks their @% doesn’t stink to such a high degree they can say anything and it will be unquestionable– bold. There is nothing such as a bald face. That would suggest no eyes, ears, mouth. That would be a bald face. Unless it just annunciates your accent, in which case it might sound like “bald-faced” but it’s bold.